The beta site is so named after the Hungarian nobleman Wolfgang von Kempelen. 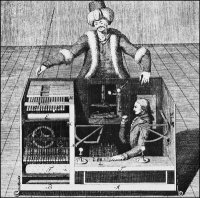 In 1769, this enterprising fellow built a mechanical chess-playing machine that apparently beat the powdered wigs off even the most astute chess players, including Bonaparte and Benjamin Franklin. Turns out, hiding beneath the machine’s intricate innards was a very small (and very brilliant) chess player. Now, the company is asking those to try their luck on “artificial artificial intelligence” — its own version of the Mechanical Turk. The site pays small sums for humans to perform simple tasks that computers still find hard to do. Someone, please pass the salt?